This is my entry for the May ATC swap organised by Lynne, owner of the Craft Den. The papers are from the 6 x 6 paper pack Wild Asparagus by MME, the sentiment is from Craftwork Cards. 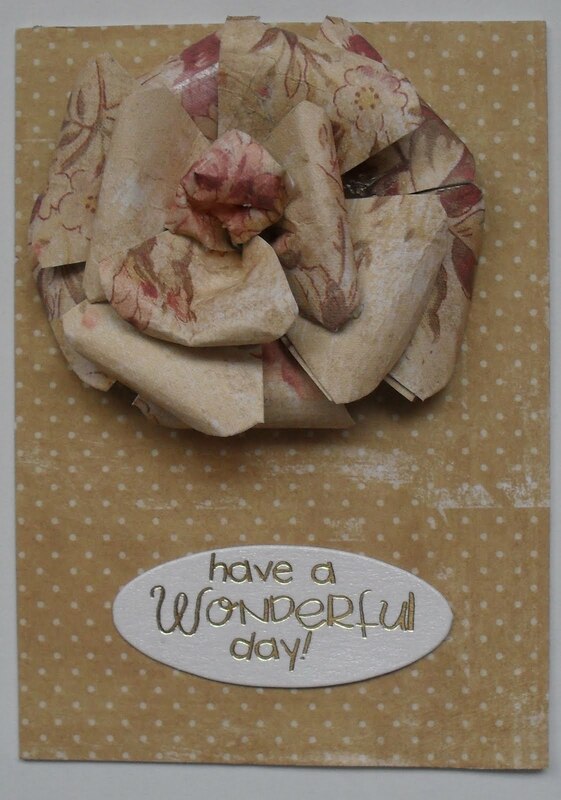 I followed the Tim Holtz method to make the paper rose. The theme for June's swap is Shoes so get out those 2.5" x 3.5" pieces of card and get crafting. I repeat "OH Wow!" Just saw this on Lynne's blog, didn't know it was yours! Even Hubby said " I'm impressed, how did she do that?" Beautiful flower Poppet! Love your Atc Poppet the flower is gorgeous. Love the ATC Poppet & I am glad you hve now got your mojo back. You should be insecure about your cards/creations, they are lovely. This is gorgeous, and the rose is fantastic, I love it. That rose is gorgeous!!! BEautiful card as always girl!! just had to stop by and tell you how much I love the gorgeous flower on your wonderful card. Hi Poppet hope you are having a lovely bank holiday. I adore your paper rose on this, its gorgeous.